Our very own Gannon University competitive cheer team put on a show Saturday afternoon at the Hammermill Center in preparation for the NCA Collegiate Cheer and Dance National Championship coming up on April 6-7. The event, known as the Road to Daytona Showcase, wasn’t scored because it was an exhibition with just the Knights performing. 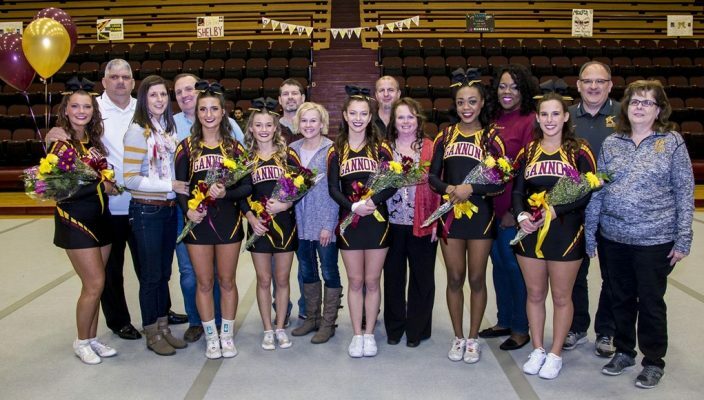 At the event, Gannon honored six seniors for their dedication to the team. The seniors were JoAnne Aiello, Kate Pearson, Shelby Malone, Danielle Munsee, Allie Mansell and Meagan Prindle. After honoring the seniors, both the women’s and co-ed teams knocked out some impressive routines. Following the show, the team concluded with the “Tumble for a Cure” event. Each member went around and collected donations from the spectators who wished to support Juvenile Diabetes Research Foundation. For every dollar raised, team members performed a handspring and tuck to get the money flowing from the pockets of individuals for a good cause. It’s great that team members took time out of their Saturday away from practicing, relaxing, doing homework or hanging with friends to put on the showcase. I don’t know about everyone else but the stunts they do are amazing. It boggles my mind how they coordinate their routines and remain in sync the entire time. On top of that, they haven’t finished lower than third place yet this season and that consistency is impressive because they have to appeal to various judges at different competitions. Munsee said the team has been raising money for the foundation since the start of the program in 2013, which was her freshman year at Gannon. This year the team raised $600, beating its goal of $500. Now the team has just over a week to get ready for the big trip south to Daytona Beach, Fla. This will be the seniors’ last hoo-rah down in Daytona competing in the maroon and gold. I’m sure while they’re all excited there is also a bitter sweetness to it. Munsee said she is excited for Daytona because she feels like this is the most prepared the team has ever been, but she said that it will be sad when it’s over because cheer has been such a big part of her college experience. As with anything we can always think of things that we could have done better but I’d say with all the hard work Munsee and the team have put in that if they did have regrets they’d just be overly hard on themselves. I wish the fellow Knights best of luck down south. Enjoy the trip and let your hard work shine through on the mats. Safe travels!